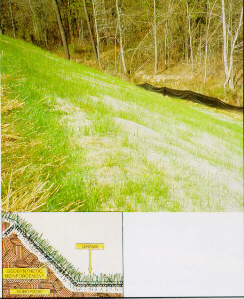 The following are the Erosion Control products that are distributed and installed by ACF. Some Product areas are still being constructed. If you have any questions on a product you can call ACF Environmental at 1-800-448-3636 or from the ACF Home Page click Ask A ?. Product Function: to stop erosion and enhance seed germination. Temporary products are excelsior blankets, straw blankets, jute mesh, synthetic fibre mesh. Normally lasts 6 to 12 months and bio-photo degrades. Semi-Permanent types are coconut blanket and coconut fibre mats. 1 to 5 years.